Have you given up on the Borough? Are you counting on Alaska DEC to quickly revise its open burning regulations so they can step in to protect public health? The News-Miner editorial board is there already: More fallout: Proposition may have killed winter burn ban 1-24-2013. What are the chances of DEC doing anything quickly? DEC doesn’t even have the statutory authority to issue citations or tickets. Even with the flagrantly polluting Woodriver OWBs, DEC waited 4 full years before finally taking the violators to court. If Assembly members want to preserve some semblance of concern for public health and safety, simply define “fuel”. 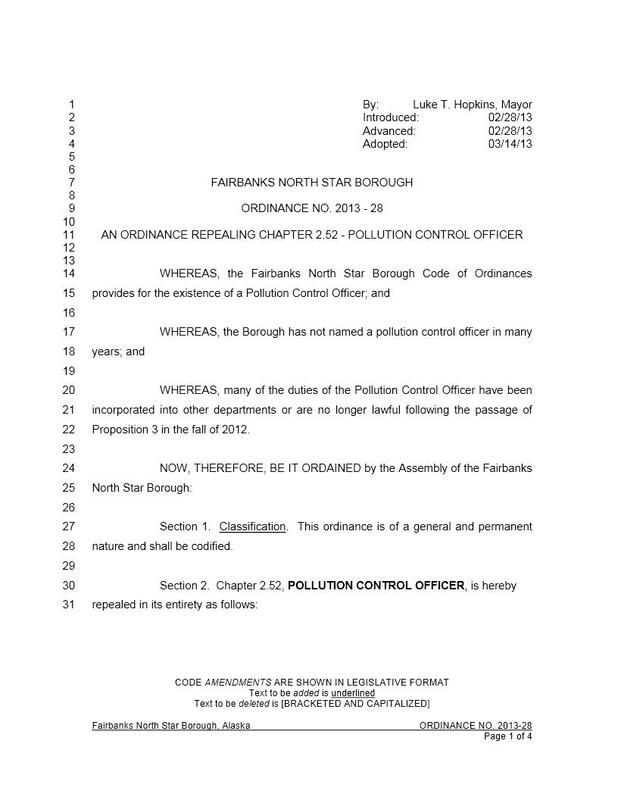 This worst-polluted winter is not the time to rush through a repeal of Borough Chapter 8.04, the entire open burning code, as does line 32 of Ordinance 2013-07. COME TONIGHT TO SAVE THE OPEN BURNING ORDINANCE! Help the Assembly make a better choice tonight, January 24 at 6 pm (agenda). How can this be? Proposition 3 (full text), passed by voters Oct 2, 2012, includes no definition of the word “fuel”. There was no discussion of its possible effect on open burning rules. There’s no evidence that Prop 3 sponsors had any intention of causing any effect on open burning rules. Prop 3 was even titled the “Citizens (sic) Home Heating Initiative” because, it was about, well, heating. Ask the Prop 3 sponsors yourself: (State Representative) Tammie Wilson at 590-7602, Maria Rensel at 455-7008/590-4164, and Tim Sovde at 458-8196. Does Prop 3 Prevent Regulation of Open Burning? Question: Is the material burned during open burning “fuel”? Answer: No, and certainly not in the way Prop 3 intended. Open burning is disposing of waste in our air. It is not heating. Therefore, while what is dumped in a burn barrel or burn pile may be combustible, it is not used for heating, so cannot be fuel. In no way does Prop 3 dictate that open burning code dating back to 1986 (or even earlier) be killed. Who knows, maybe a future mayor will take an interest in health and safety and actually enforce the code. For those who may be tempted to allow the repeal of our open burn rules as a way to lay blame at the feet of the Prop 3 sponsors — State Representative Tammie Wilson, Maria Rensel, Tim Sovde and others — you’re not using your noggin’. Do you think Prop 3 sponsors care about your health or public health in general? They’ll say, sounding shocked, “Don’t blame us. That was not our intent.” True, but don’t expect them to take a stand against repealing the open burning rules. The Mayor erred in recommending this ill-conceived, unnecessary, injurious proposal to the Assembly. But only the Assembly has the final say. Lay full responsibility at the feet of your Assembly. It’s their vote, their choice. Other terms defined in Borough Chapter 8.04. All are repealed by Ordinance 2013-07. “Construction n debris” means any waste or unused material resulting from the building, remodeling, construction, addition to or repair of a structure, including but not limited to wood, plastics, rubber, vinyl, insulation, carpet, or metal. “Garbage” means any putrescible solid or semisolid animal or vegetable wastes resulting from the production, handling, preparation, cooking, serving or consumption of food or food materials. “Open burning” means the burning of a material which results in the products of combustion being emitted directly into the air without passing through a stack or flare. “Putrescible garbage” means a material that can decompose and cause obnoxious odors. “Refuse” means any putrescible or nonputrescible solid waste, except human excreta. “Smolder” means to burn and smoke without flame. “Untreated wood” means wood that has been modified from its natural condition only by cutting, breaking, drying or absorption of moisture. Wood or wood fiber that has been painted or artificially impregnated with volatile chemicals does not constitute untreated wood. A new voter initiative sidelines the Borough from any role in restricting air pollution from heating appliances if approved October 2. The Borough would be unable to stop those who burn “any type” of noxious or toxic materials for heating or smoke-out schools and neighbors. EPA’s deadline for meeting PM 2.5 attainment is December 2014. The initiative sticks the oh-so reluctant Alaska DEC with the job of reducing winter smoke pollution. To date, DEC has taken no action to stop air polluters harming public health in the community. Quite honestly, neither has the Borough. The borough shall not, in any way, regulate, prohibit, curtail, nor issue fines or fees associated with, the sale, distribution, or operation of heating appliances or any type of combustible fuel. “Heating Appliances” is defined as, but not limited to: oil furnaces, gas furnaces, wood stoves, coal stoves, wood-fired hydronic heaters, wood-fired furnaces, coal-fired hydronic heaters, coal-fired furnaces, masonry heaters, pellet stoves, cook stoves, and fireplaces.